Tom started in the printing ink business in 1977. He started as an ink production person, was transferred to the lab, then into tech service. After that Tom was an in-plant technician for several years but was ultimately promoted to a technical sales and branch operations manager. Tom has worked for several large companies over his career. 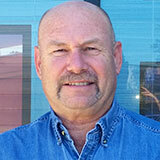 Tom was hired at Gans Ink and Supply Co. in 2003, to run the UV ink division in Salt Lake City. Tom is married and has 5 children between his wife and himself. He enjoys drag racing and fishing hobbies.